Yesterday we were witness to one of those little things that makes this place so special. Going for our afternoon stroll, we found the rails along the Urumea river had been turned into a barre for hundreds of ballerinas. We watched as they ran through movements and classic music wafted through the city's air. 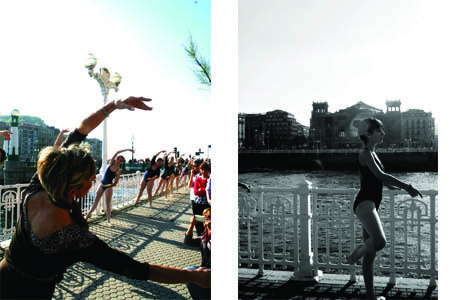 An announcer called out the steps in Euskera as the ballerinas executed plies, first position, battement, while grasping the iconic rails of San Sebastián's coast. The historic old part and the Bizcayan Bay formed a perfect backdrop. Apparently it's a tradition that is going on 15 years, to celebrate el Mes de la Danza, or the Month of Dance. But for us it was just another beautiful Sunday.